What a beautiful day we had. Blue skies, clouds, a little drizzle and lots of action. I have lots of gigs of video to go through and find some highlights. We had 3 cameras running on 3 tanks. Of course, as with any production there are always a few glitches. Like barreling into the pine boughs at break neck speed is a sure way to change the camera angle. Also, the cameras ,as always, seem to attract an inordinate amount of paint. All on the front lens of course. And then you have the names you find after the stars at the end of the movie. You know, key grip, 1st sandwich maker, best boy etc. Some are experienced and others are family to the producer. With that said, you decide who this person would be on that list. 1. Press bottom front button. Check! 3. To being filming press top button. I guess I should have a flash card showing the difference between the movie icon,which looks like a real movie camera, and the camera icon, which, amazingly looks like a camera. Anyhow, this operator thought they were starting the video process 4 times. Or just admiring themselves in the lens. You decide. Paul and John are at a stand off and Frank comes whipping through the trees on Paul's team. Paul thinks he hit John twice. But, the video shows that while indeed he did score two hits, one of them is on Frank. Check out the slow motion replay. Hmm, I wonder if that was a kill shot on Frank? Anyway, another good example of maneuver and fire. If remember rightly I scored hits on Paul when he came out of those trees. This video is of the beginning when the Jeep was in use. Early on you'll see the Tiger and Paul battling in the open. Notice how Paul gets a move on when a shot comes across his bow. Even a veteran forgets there are other enemy tanks coming up on the wing. Paul's priorities are a little skewed. 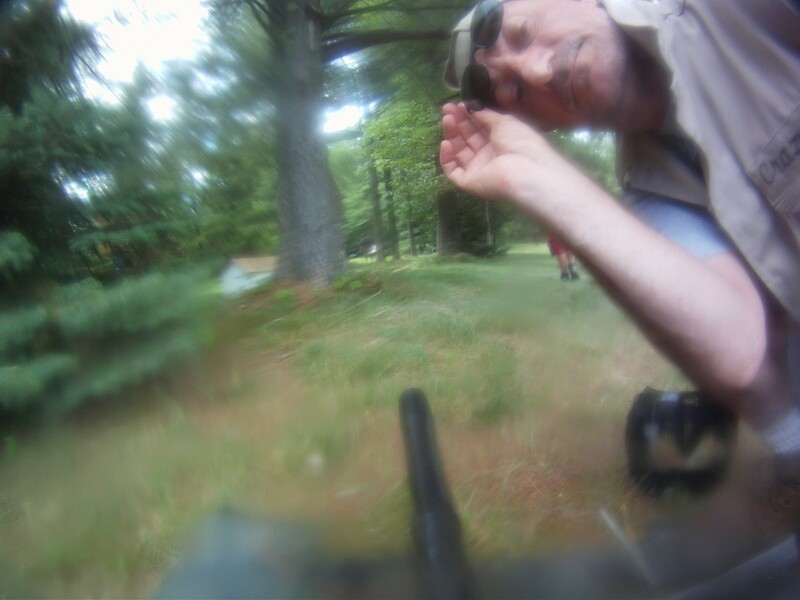 Seems he thought the Go Pro was a target. I wish I could have had the videos shown side by side, but I think you get the idea. Field testing of the improved torsion bar suspension in Paul's new M60 Patton. The stiffness of each torsion bar was increased to provide better support in dynamic situations and hard stops were added to the road wheels closest to the drive and idler axles to reduce their overall movement. Field testing of the leaf spring and rocker suspension in Frank's new Semovente hull. Leaf spring stiffness was increased to handle drops over large obstacles (like the tree root in this video).